If you are like me and have long admired the longevity, distinctive mod styling, and careful brand aesthetic of British retailer Fred Perry your heart may have skipped a wee beat when you read those words. Fred Perry Knitting Patterns? Really? Yes, really. The gorgeous golden cardigan on the left currently retails on Fred Perry’s website at £125, but the company is also offering knitters the amazing opportunity to really re-create this look themselves – why not download the pattern for free and whip one up today! There are eleven designs for men and women, including both garments and accessories. Every attention has been paid to the patterns’ careful vintage styling and ‘authentic’ mid-century graphic design and layout. But sadly, the same care and attention has not been paid to the content of the patterns themselves. 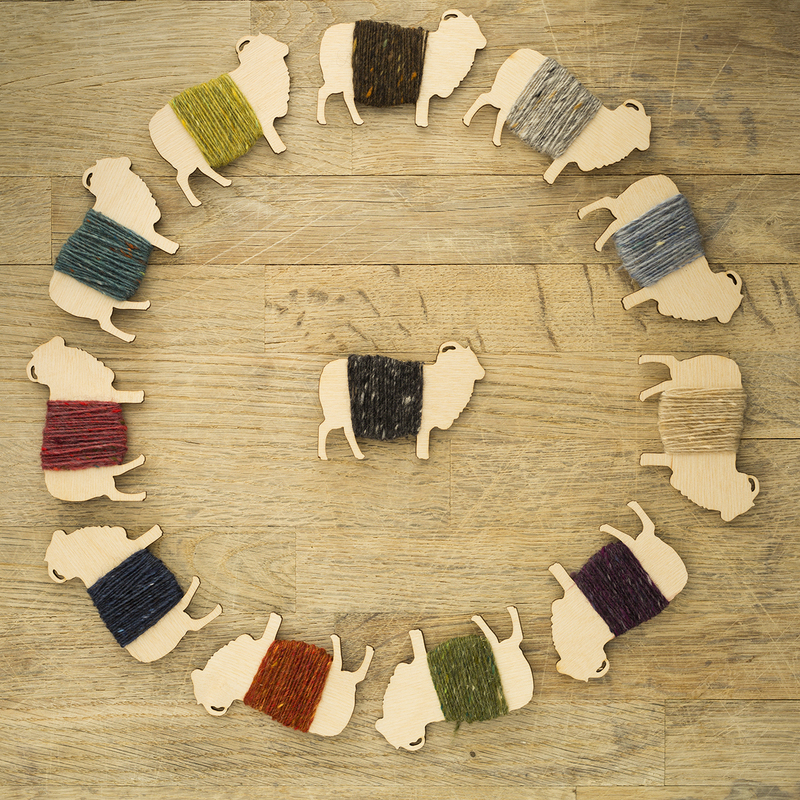 The recommended yarn for these patterns is Rowan British wool Red Faced Leicester. Have you come across this yarn? 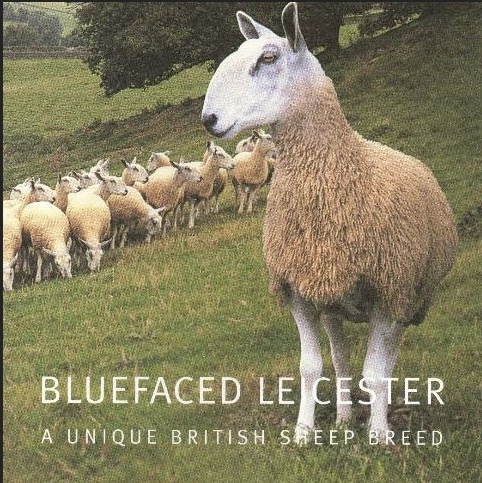 Or heard of a Red Faced Leicester sheep? No, nor have I. In effect, Fred Perry is suggesting you knit this sweater with a yarn which does not exist, that grows on a non-existent sheep. One must assume Fred Perry is unable to distinguish between these delightful creatures and others, equally delightful, but rather different. Sadly, the problems don’t stop there. There’s no gauge or sizing information (! ), nothing about yarn weight, quantities, shades, or other materials required, and the ‘language’ of these patterns would, I imagine, confuse any hand knitter either vintage or modern.
. . . certainly this contemporary knitter could make neither head nor tail of the incomplete and oddly constructed Cabled beanie pattern, which you might imagine, would be one of the easiest designs to get to grips with. 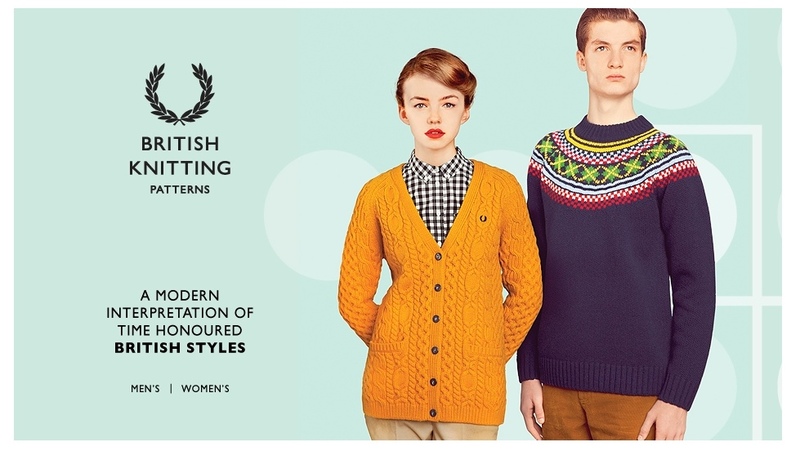 Could it be, then, that Fred Perry’s offer to “knit your own” garment from their Autumn / Winter 2013 knitwear collection is merely a sneaky marketing ruse? A way of spinning and bolstering the brand identity of mass-market knitwear through recourse to familiar ideas of the ‘vintage’ and ‘handcrafted’? Surely not! But, when you fail to knit yourself a lovely golden Aran cardigan from Fred’s badly-put-together pattern (which fails to include instructions for the sleeves) , you can easily return to the website to purchase one ready-made. 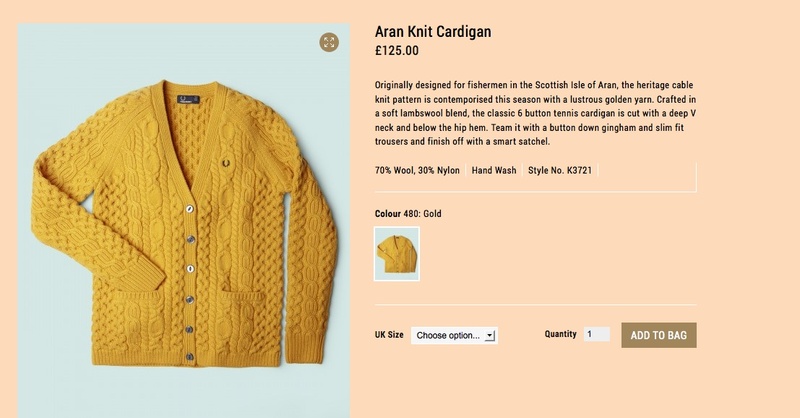 As you can see, this cardigan was “originally designed for fishermen on the Scottish isle of Aran” [sic] as opposed to the Irish Aran islands . . . you know, Fred, where actual “Aran” knitwear comes from? Perhaps the error-ridden and confusing “knitting patterns” are merely the tip of an eroneous marketing iceberg? Oh Fred! How cruelly you shatter my mod dreams! Discussing a British brand I like and admire in this context is all the more galling as I really think these patterns are a brilliant idea. Why not engender more collaboration and interplay between high street retailers and hand-knitters? Between ideas of making and consumption? Between the world of “knit” as it is currently taught on fashion and textile courses, and the world of “knitting” as now practiced all over the world by savvy and talented craftspeople? Having had a good look at the Fred Perry Knitting Patterns, it strikes me that their single biggest problem is that they have been produced by someone who might know an awful lot about designing for Shima knitting machines, but has no understanding of the evolving descriptive vocabulary of contemporary hand knitting. With just a little more effort Fred Perry might have produced something truly innovative here, rather than this epic – and slightly cynical – fail. All of your thoughts are welcome. Thanks to Karie (@kariebookish), Helen (@ripplecrafts) and Benjamin (@knityounexttues) for the enlivening twitter debate which prompted me to write this post. I have to admit I was a bit surprised about this post, because here in Germany Fred Perry is considered a “skinhead brand” which is especially worn by the posh intellectual type of neo nazi guys. I know that the history of the brand does not in any way support this, but somehow this is how those clothes are coded here, so most people wouldn’t touch them with a barge-pole. The cynic in me does wonder if it was all a big marketing plan by Fred Perry. Here we all are, talking about Fred Perry, introducing the name to people who had never heard of it before who are now also talking about it. They do say there’s no such thing as bad publicity. A well written blog post about a marketing gag gone wrong… I didn’t want you to miss it, hence the reblog. The patterns seem to have vanished this morning, although there are still references on the site. It seems this is another instance of folk underestimating the skill it takes to write directions for somebody to replicate a design idea. I s’pose their stylists and graphic designers had a fun few days. EdwardianModiste – very true but I would expect anyone in PR to have some knowledge of social media outside Facebook and Twitter and I can’t believe that it didn’t cross anyone’s mind that someone just might look at one of those patterns and think that they could knit it. Clearly it can’t have done – they wouldn’t have published them in that state and then had to swiftly remove them if it had. Charlotte – if it did cross someone’s mind what did they think was going to happen when a few million knitters saw them and even a fraction of them thought they could just knit them? nothing? or if they were media savvy did they know this might happen and we’re playing right into their hands? Holy macaroon, you’re a tough audience and if I might say, have allowed the steam from your collars to cloud your senses somewhat away from your usual thoughtful responses..
With no stated provenance to go by, it may be that this pattern was one of thousands published by wool manufacturers in the 40’s or 50’s and the Perry company has simply reproduced it, making the ‘mistakes’ you see original to the designer, who was normally uncredited. It also doesn’t have benefit of the context of the pamphlet or book it was in, where elaboration is often supplied. The term Cast Off and beanie and Red Leicester may identify it as an American design?. Anyway, vintage patterns often assumed a high level of knitting experience, ability to be comfortable interchanging needles and yarns and self reliance in interpreting instructions; embedded in them though are often some stunning techniques. It is knit on straight needles and down to Row 46, is straight forward :). Note that the cable is worked on the purl side? As you start Row 47 you realize it ends after the 28th stitch. You put the rest of the stitches on a holder, as directed in the pattern and work Rows 49-73 on the 28 active stitches. You have now completed Section A , which you have deduced it is because B,C and D follow. You then “move on to the next section”, meaning you work the next group of, in this case , 27 held stitches (Section B) starting with it’s Row 47 and then repeating Rows 48 – 73 as per Section A. Section C is the same as Section B. Now you have 3 sections that look like Gothic windows sitting on a ledge plus 33 stitches remaining on the needle at ‘ledge’ level.. Section D is a little different. You work its’ Rows 47 – 57 (which are different than the other 3 sections), and then “continue as per Rows 58 – 73” – that is, continue with Rows 58-73 as described for Sections A,B and C. Your brain would fill this in as you progressed. Of course they don’t have to mention that you seam the sections together because you know you’re making a hat. I think I’ll try it and see if it works. I love the idea of the seaming, which a beanie normally has. I’m going to take extra care with the edge stitches on the four sections and join the seams so they show on the outside, adding to the coolness factor. If I make one in smaller gauged yarn and needles for a child, I may try knitting each section in a different colour. For what it’s worth, – all best to everyone, r.
If they were just publishing any old pattern how did they manage to make their own models for sale without noticing shortcomings in the instructions? Are you suggesting that in the past you had to figure out how to make your own raglan sleeves based on what you had learned knitting the front and back? This was one of the shortcomings of the cardigan pattern. Red Leicester is cheese not a sheep whichever side of the pond you are on! As mid range fashion the garments for sale are mass produced on factory machines and bear no relation to handknitting, just as these ‘patterns’ bear no relation to reality. An amendment has been put on Ravelry that these patterns are not in fact real, they’ve been taken off the Fred Perry website and I think that should be the end of it, it’s clear to me that their only mistake was made in adding those strange instructions (I don’t care where they came from) to the patterns when just the front covers would have served their purposes just fine. 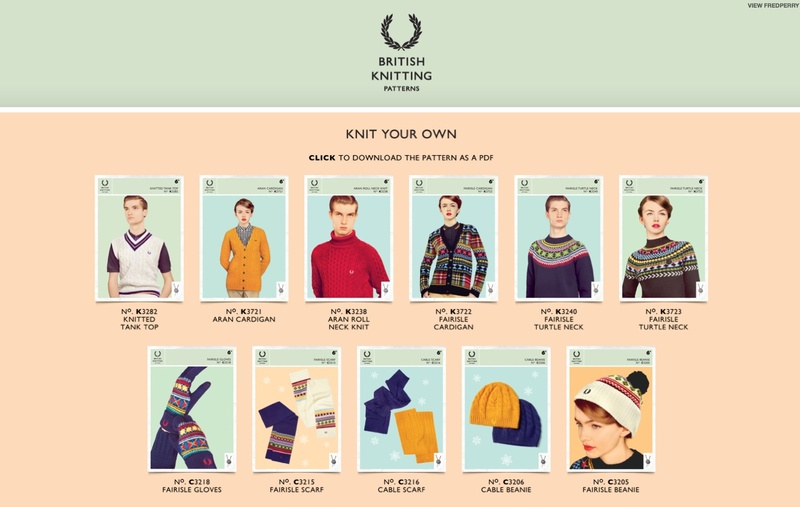 British Knitting and heritage? Fred Perry became a U.S. citizen in 1938, it was a Mastermind question last week. I thought it was just me that that noticed. I am afraid to say that I think it was a marketing ploy – I am not sure it was even cynical – just badly researched and lazy. Someone in an office somewhere in Soho will have said ‘Knitting is really cool at the moment – lets imagine a few knitting patterns to go along with our campaign and it’ll look fab – all retro and vintage’ – stupidly the same person – who is no doubt employed for their social media awareness failed to notice the obvious social media or probably even visit a haberdashery department. I suspect that they lifted the patterns from some old magazines they bought off of ebay or found at Camden Market. As you say a great marketing opportunity missed. Thanks a lot, Kate, like always. I just sit here by myself and smile because I adore your skill to write such witty, funny and clever entries everytime. Looks like the patterns have been removed – place your bets now on whether they will be tech edited and re-released as usable patterns or whether they will never be spoken of again…. My money is on melting away. hah. Have you SEEN the seams on that fair isle yoke??? Makes me want to stab myself with DPNs. didn’t know if I should laugh or cry. Your post was fantastic and the comments even better. I guess it proves that it’s all about marketing = groovy photos & “FREE” always works!! Wondering if it is for real or simply a wacky test from a university Marketing class? Either way::::::::::::::::THANX for taking good care of us, sister Kate!! I find this very funny, ironic, and sad. I kind of like Fred Perry’s style, but maybe I kind of don’t like them that much. I read your whole post and I didn’t rush off to download the pattern for that fetching cardi. Halfway through reading I thought, “this is a good idea”, but then I got to the Red Faced sheep and the Scottish Isles of Aran and I’m still laughing. Yeah, Fred Faced Leicester, maybe. I’m with you in thinking that maybe we are not really supposed to make the sweaters at all and just buy them. Unless knitting is easy to us and we can just whip one up based on the photos. Maybe they had good intentions and just didn’t do so well in the delivery department. I just went to the site and it looks like the patterns have been removed. 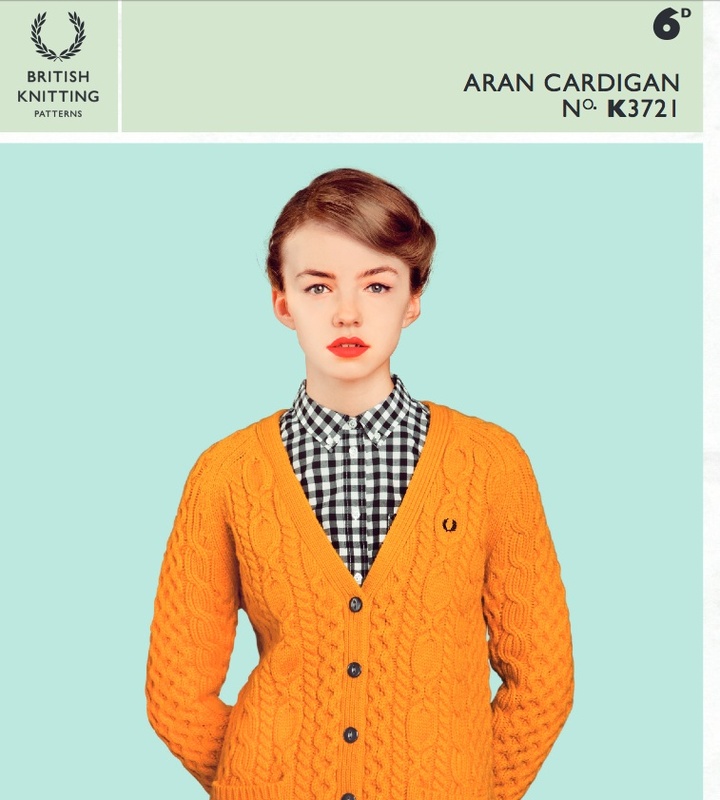 That cardigan description now says the “Irish isles of Aran” so they’re clearly listening – and now presumably hoping that we’ll just forget all about it. Marketing fail! No instructions for sleeves? Maybe they wanted us all to make vests? Got a good laugh from the Redfaced Leicester! Maybe they didn’t realise how many of us are out here that would notice/care how poorly written they are? heh. Funny. ‘We thank you for taking the time to bring this matter to our attention. Which is as useful as a chocolate teapot. I might just keep hassling them, I’m retired I have the time, though I suspect their response will be more auto generated tosh. I had the exact same reply (word for word) to my suggestion that they have the patterns properly tech edited and re-released as a sign of their commitment to the idea (which is a great idea but poorly executed). I responded asking to be notified once the corrections have been made and the website updated. I am pretty sure that this is an ill-conceived marketing ploy gone bad (though if their market audience is non-knitters it may be quie effective). As for me, I am glad I have the box of vintage 1950s and 60s pattern books my mother gave me; I prefer my vintage long-sleeved cardigans to have sleeves. Very disappointing all round. Even the ready made show a disregard for motif placing on the yoke when inserting the sleeves. As such they betray at a glance that this is machine produced fabric sewn together with little consideration for the design. This is then reflected in the knitting patterns. 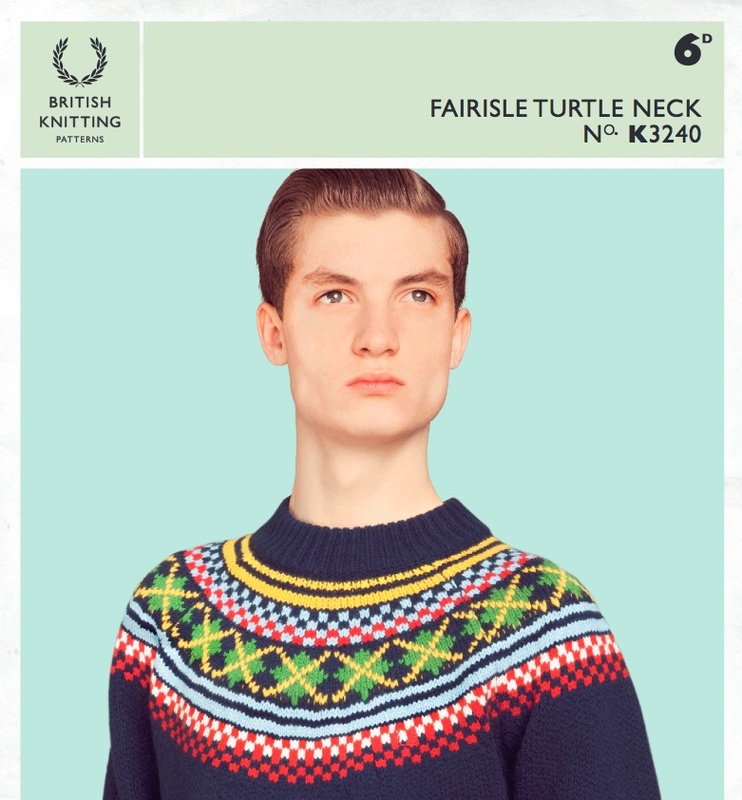 The charts for the Fair Isle turtleneck appear to include partial motifs too. I’m thinking this is all totally fake and they just put it up “to be cool”. Who knows whether the actual pattern itself may come out the way it is – it could just be a whole lot of k1, p1 without any design direction! A huge marketing ploy this is. Sad because Fred Perry could have started a whole new cool revolution…well these patterns were free which is another fishy thing! it strikes me this is a ploy by their web metrics people to get a high number of clicks on their website in order to inflate its value. I am convinced this is a pattern that has been lifted from the archives and the only thing that might have been changed was the size of the needles (from size 8 to 4mm) and has anyone managed to verify of Rowan’s knowledge of this? I’d love to find the original pattern! Yeah, does Rowan even know about this?? I think the idea was to have the knitting patterns just lying around the house so that the wearer could pretend to have made it her/himself. In the same vein as those newspapers from your birthdate: how many people actually go to the archives and verify that the “news” is real? Presumably a whole lot of “newsies”, but you get my point. Fred Perry are assuming that the market for £125 cardies is probably not the same market as for free knitting patterns. And I have to believe: if they were serious about publishing patterns for the hand-knitter, they would be quality patterns with the right tension, sizing etc and the prices would be equivalent to Vogue. After all, they are trying to sell expensive knitwear – what’s in it for them if they *give* away the pattern? Exactly, well said – all in all a cool if misguided advertising gimmick and no more. I’m not expecting any real Fred Perry Knitting patterns to come out of this, which is fine, I don’t like any of the designs anyway. Hi Kate – I must say that I thought how wonderful at the mention of lovely vintage knitting patterns on the Fred Perry website. Fred Perry is a voice I grew up with 50 years ago – summer afternoons with the pat of ball on racket at Wimbledon, Billie Jean King, Rod Laver……. Fred Perry a very British name. I have written off to the company to point out that the idea is terrific but the patterns need more work and are subject to the scrutiny of expert knitters worldwide……. Hello again – Just had a reply from Fred Perry to say that they are looking into any problems there may be in the knitting patterns and that the situation will be resolved shortly. So, we will see….. I had another explanation in mind – that the patterns are actually re-issuings of vintage patterns that generally did not have much in the way of sizing or gauge information. But you know, even vintage patterns generally included the directions for sleeves. Before all this brouhaha over the patterns,I actually read the patterns and found they were lacking in every paragraph. I do sample knitting for designers so I read and reread patterns before I knit them. I also do not need a pattern in order to knit an item,especially in regards to stranded knitting. If ALL knitters took the time to read the patterns,they would soon learn to distinguish pattern errors before embarking on the task of knitting the chosen item. I feel very sorry for the company that posted these patterns. They did not research that the patterns were viable with correct information on yarns,sizing and instructions via a tech editor. I’m sorry this company does not understand that knitting is alive and well and being lovingly tended by armies of knitters. Wow, look at the new audience they’ve discovered. Lots of free, albeit negative, publicity. A couple million hand knitters now know the brand and will be watching for improvements. Very rapid access to a huge market. I feel sorry for anyone who decides to take up knitting after seeing these patterns, I think a lot of people make the transition from wishing they could knit to actually picking up needles and yarn as a result of being inspired by a specific pattern and wanting to knit it. I would most definitely not be a knitter if patterns or indeed the first pattern I had picked up had sizing instructions as vague and gently dispiriting as these. Size will depend on your tension and needles used. Ha! ha ha the hat pattern has no details on finishing, it doesn’t even refer to casting off! This is really bad as pattern mentions holding stitches and also mentions sections B/C and D suddenly without any reference to section a A or what the sections refer to? The top of the most be knit in sections and then seamed up but a beginner knitter would be very confused. I agree with above comments that they must be copies of old/vintage patterns. I’ve never seen a modern hat pattern with construction like that!! I remember the eighties when knitting patterns were a huge style joke, used for ironic greeting cards. It would be alright to use vintage pattern imagery for advertising ready made garments…what I don’t get is why they included ‘instructions’ in that imagery without any kind of disclaimer. Unless they are unaware that knitting is alive and well and that people will try and follow these. Shame on you, Fred Perry. Interestingly, I have had in the queue in my head for some time the sweater, Medallion Aran, from Madeline Weston’s lovely book, “Classic British Knits.” It is very similar to, and in the book, knitted in exactly the same color as the golden cardigan you show us above. I would suggest this book as an alternative to the error-filled Fred Perry patterns. The book is “dated,” which means that the sweaters are oversized on the models and lack waist shaping; nothing a choice in pattern size and a couple of decreases couldn’t fix. 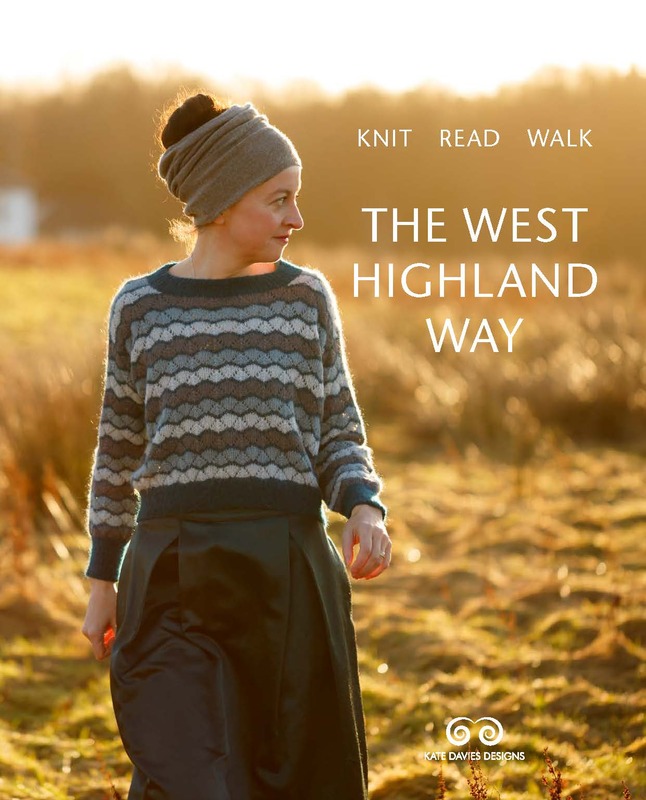 The patterns are lovely and the author knows where the Aran Isles are. But it just seems a terrible marketing ploy. I keep looking for some some of “for advertising purposes only” disclaimer. Are we meant to believe the garments were created from the patterns? I’ve looked at a few of the patterns and aside from the yarn-brand lapse, they mostly just look like old vintage patterns that have one size, assume a great deal of knowledge and have no cable charts. Maybe the designs are rip-offs of actual hand-knitting patterns? I’m not defending them as clearly they know nothing about modern knitting patterns, but I have my doubts that someone sat down and wrote all that without expecting someone to use the pattern. Classic misleading advertising in my opinion, and a snipe at hand knitters. Did they mean to imply that their machine made garments are somehow better than their hand knitted antecedents? What a cheek! I wonder how Rowan yarns feel to be associated with something so badly put together – if they are suggesting Rowan brand yarn (even if it’s a mixed up one) are used it gives the impression Rowan are somehow involved. A shame as some of the garments are things I’d definitely have wanted to make, and been happy to pay for the pattern if it was properly put together. I knitted an Aran cardigan, similar to the golden one, for my Mum in 1970. I had just started work and it was one of the first major expenditures from my wages! I left a reply to the comment by Karen Templer, who remarked on the pattern being written out, rather than charted. Years ago, patterns were written out, and I still prefer written instructions to charts. Often the patterns assumed a degree of skill, as they would state “continue pattern as set”. How hilarious would that be? You purchase yarn to knit a beautiful cabled cardigan to find no instructions for sleeves. You’d be laughing all the way to Fred Perry’s to give someone a swift kick! I think this maybe just a marketing gimmick. I noticed that the patterns have been made to look like a vintage pattern from the 60’s no doubt to fit with the Mod image that Fred Perry seem to promote. Perhaps they thought it was just a bit of fun even though I think it a rather cynical attitude to assume everyone would be in on the joke. As far as the ‘Red Faced Leicester ‘ that is either someone having a laugh or not bothering to do a quick Google search before posting it to the world, either way I think it a little silly for such an established firm. Wow, this is fascinating. I queued the cabled cardigan when I saw it pop up on Ravelry a few days ago, but I hadn’t actually looked at the pattern until reading this post! It almost makes me wonder if they took a vintage pattern (explaining the written out nature and one size… not that all vintage patterns are one size or written out but obviously many are) and “re-worked it”. 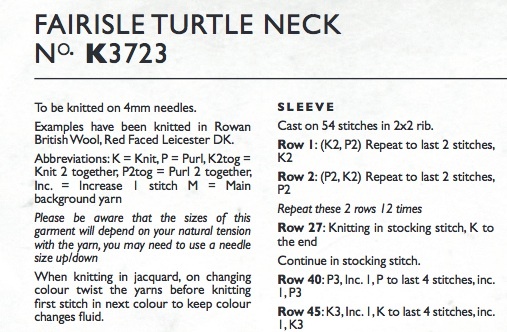 And by “re-worked” it I mean someone who doesn’t know anything about knitting was asked to transcribe it, forgetting lots of important key things for actual knitters that you pointed out, like gauge and sleeves (!). And obviously not adding multi-sizing. And then, well we know the unfortunate rest. It’s a shame too, because I thought it was pretty darling and an interesting concept to offer patterns for items they’re selling. I agree with most of these observations, though at least a few of the patterns call for DK weight yarn, so we do milk now the yarn but not the gauge or sizing. Ha ha haaa, no sleeves and no sizing. Definitely put together blindly to appeal to the vintage ethic. I would lik to know if Rowan have any involvement. Bit disappointed too…. I can’t get over just how appalling these patterns are! Clearly no hand knitter has even looked at them before they have been published and even if it was possible to correct the mistakes I think it would probably be quicker to just reverse engineer the pattern if you really wanted to knit it. The fairisle beanie doesn’t even list a recommended yarn and none of the patterns I have checked list a tension. Also the idea that any of these are knitted in a commercially available knitting yarn is preposterous. They are clearly not knitted in any Rowan Blue Faced Leicester DK (not red faced, although Fred Perry as a company should be) yarn, as the only Blue Faced Leicester that Rowan make is Rowan Purelife Blue Faced Leicester DK which is only available in natural sheep shades, not the saturated, bright hues shown in the pictures. Debbie Bliss make a Blue Faced Leicester DK yarn, but they haven’t used that either, as all the colours available in the yarn are heathered shades with much more depth and complexity of colour. Rowan also do a Pure Wool DK, but again the colours are wrong and I doubt they would want to be officially associated with these patterns. I could spend all day pulling these apart, but it just isn’t worth it. What a cynical marketing ploy. Well, can’t say I am surprised. It’s a company that sells ready-made knits and it wouldn’t make much sense to provide too much detailed information on how to replicate them. Even hand knitted. And I also don’t think they are obligated in any way to follow current trends/standards of the knitting community since we are not their target audience. On the other hand, trying to use an active community and the fact that knitting is becoming so popular that gets aired on British television, in order to get more publicity, is cheap, but a simple marketing strategy. That is a fantastic idea, but I agree…also a huge disappointment. I love the look of that yellow cardigan. That’s too bad. This is very interesting. I just had time to skim your post and glance at comments. One of the things I remember very fondly about the American designer Perry Ellis, was that each season the company would release lovely patterns for the sweaters that were included in the ready to wear collections. I need to look into this more, because I was quite young then and barely knitting more than scarves. There was a wonderful sweater with an intarsia rose on it that was so dramatic and well proportioned for the era (a bit boxy with tapered, high waisted ribbing). All this is to say that I agree, I think it would be wonderful if there was more interplay with designers and hand knitters today. I think TSE cashmere offers some kits, but those are beyond my means. Oh my, if Jil Sander or Dries Van Noten would create patterns for their designs? Heaven! Oh holy wow, I was shocked to read this!! so kate, I know you could design an aran sweater which would be much more interesting to knit and to wear. I’m hoping…..
Oh wow, I had seen the patterns on Ravelry a couple of days ago and I liked them. I wanted to look into them on a later date, but thanks to your blog post I know I don’t have to. Such a shame, because I really like the idea behind it. Such a pity it isn’t executed properly. Thanks, Kate, for bringing this sad situation out in the opn. Rodger has the right idea–Look at the pictures (with magnifying glass) and we can try and figure it all out for ourselves. Fire the ad agency for not doing tneir research. They should know that knitting is a thriving craft- if they researched. and not one, but two unmentioned seams! inserted to avoid shaping! That lovely aran/cabled cardigan has row by row instructions for the entire garment but not for the sleeves. It is a cardigan with no sleeves. In my opinion, it is definitely a badly executed marketing ploy. I am not impressed. The more of these I read the more ridiculous it all sounds. I want this on the ten o clock news! I can’t believe a famous (I’ve never heard of him) retailer would do this and risk the wrath of his followers. What a bad marketing move. I hope you will give any follow ups from this pattern debacle. I wonder if someone gets fired for this? Also, it looks like the recommended yarn is a wool blend— blend components not specified and possibly, given all the other mistakes in this output, a synthetic. Is Wovember starting early this year? I posted a heads-up about these patterns today, too, and have a follow-up for tomorrow planned which was inspired by the laugh I got when I downloaded the cardigan and saw that it was all written out instead of charted! I wondered last night whether they had been tech edited, because what a nightmare to write all that out, much less edit it! But in my amusement over that, I didn’t get as far as noticing that there’s no sizing info. I think it’s more likely a matter of giving the project short shrift than actually trying to manipulate people into buying finished goods. I mentioned in my post that the video they produced that’s supposed give some context doesn’t give any. But it’s a chat with a sample knitter, I take it, who says something about having wanted to show how the same designs would look if handknit. My guess is someone suggested it to them, they thought it’d be clever and, sure, a good marketing stunt, but that everyone involved underestimated what it takes to produce proper patterns, and so the whole thing got short-changed. They probably didn’t think anyone would actually try to knit from them. I did wonder about the yarn. Had heard of red-faced breeds, but never of any red-faced Rowan yarn. Now I’m even more curious whether Rowan had any knowledge or involvement in it at all. I remember when patterns were all written out – I still prefer written patterns, rather than charts. Me too, and I’m not an ‘old school’ knitter’ – I just can’t physically differentiate between the squares on a chart so I need to read and knit each ‘sentence’ like a book. I hope all patterns don’t go chart only. I’d be stuffed. I would love to hear a response from the Fred Perry team and hope they would ask (and pay you handsomely) for assistance to make this right! I still have hope. Maybe if his team is made aware of the numbers of knitters on Ravelry, it may pique his interest. BRILLIANT! I think this is a really impressive gesture by the retailer. I’m going to bookmark these immediately. Thanks for bringing them to my attention. I never use the recommended yarns, so it doesn’t bother me that the suggestion is a red herring. Also, I think most of us will spend more than the sale price of these sweaters in time and resource to make our own version. I don’t knit to save money. It would be an impossibility, as far as I’m concerned. How cynical, and sad. I hate to think it, but I think it’s a marketing exercise in total. I mean, they probably can’t even imagine that people knit these days, so would probably be rather surprised that there are ‘real knitting patterns’ these days. I think this is another example of ‘dumbing down’. I doubt that the patterns were ever intended to be really knit; they are the ad agency’s idea for creating a ‘vintage’ or ‘retro’ vibe. Perhaps they don’t realize that hand knitting is alive and well, and practiced by millions – including the young and hip? Thank you Kate for exposing the pretense! Sadly, I think you’re right on here. They were obviously totally out of touch with the reality of today’s knitters. I agree, except that I think it’s even worse than “dumbing down.” I think it’s a completely cynical marketing ploy to cash in on that “retro/hand-knit/here we are “nesting” vibe. Also maybe to make us give up on knitting and just buy theirs? I’ll just be over here, drafting my own pattern from the pictures…as usual. I have a great disdain for most people’s actual patterns, even if I like their designs and ideas very much. 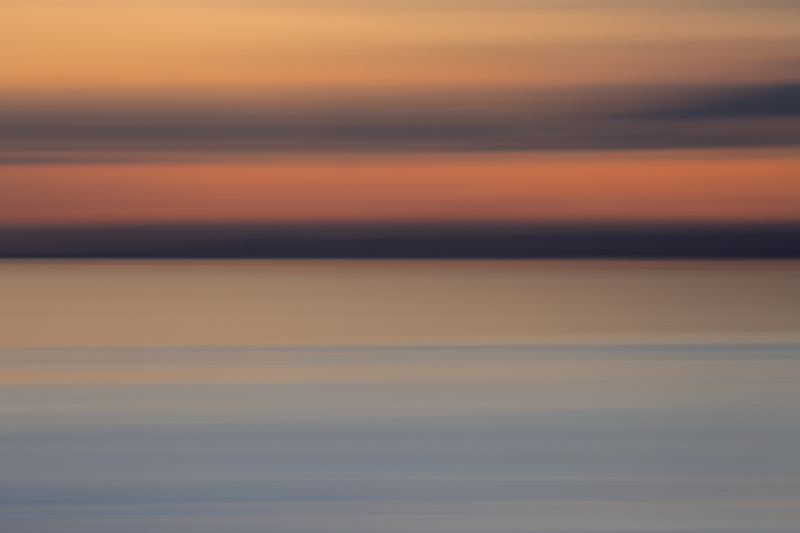 I am usually recreating something from a photograph if I’m not fabricating it wholesale from my own imagination. I am currently doing ten rounds with a rowan pattern for a cable jumper in which the pattern does not seem to fit the stitches in all the sizes. I am about to knit a swatch using the full quota of stitches for the biggest size just to see if I can figure it out. Pride is at stake now! The pattern is two different twisted cables with garter stitch in between, I picked it because ot looked easy. I have also started a shawl in ju jus loops 3 times. I don’t knit a huge ammount any more but I still have all my marbles and have been knitting myself jumpers etc. since 1979. Am I just unlucky or are patterns unnecessarily complicated these days? It saddens and mystifies me that some designers do not seem to have a clue about how things are made or appear to test their patterns. Patterns are unnecessarily complicated AND you are not going crazy. We all know the same ones are terrible over and over again. I wish I could name names, they would be horrified. (one hopes) If you have knitter friends, you might see if they can read the pattern a little differently and figure it out with you. Sometimes a fresh pair of eyes helps. Yes, and be sure to volunteer to put it right and charge them a king’s ransom to do it!!!! Just sayin’…. What extremely bad marketing which, I can only assume, has been done by a total NON knitter. I hope you have made them aware of their HUGE mistakes and if so, that they will have the decency to get back to you with an answer on how they might put it right. Thank you for pointing out the holes and saving others the time and bruises of stumbling into them, Kate. 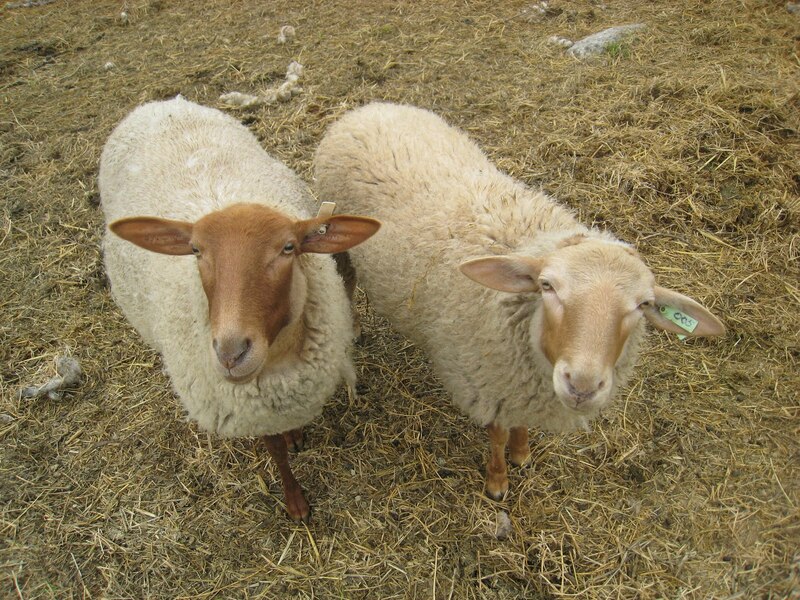 In addition to California Red, another red-faced sheep is the American Tunis. There are some continental breeds as well, and the UK’s Portland (one of my favorites) has a sweetly warm (if not red) tone to its face. But Red-faced Leicester? That’s probably related to the red-faced (or should be) marketing department. Haha….excellent comment. Those red faced sheep are lovely though…makes me wish I had a farm. how about we all download the patterns, and then bombard the marketing dept with questions about their badly constructed (or constricted, as I very nearly typed) patterns? And thirded! Thing is, I’m sure people would be prepared to pay something for a properly written pattern, so it would be worth their while to get it fixed – and they REALLY don’t want the wrath of the World’s knitters upon them!! WOW. It’s astounding how they could get so many things wrong. And with the incredible wealth of knitting resources (both human and online) available, there’s really no excuse for it! I didn’t read your whole article to begin with, I was too excited and went straight to download the designs. I thought I must have something in my stash that I could use to knit the fab patterned cardigan. HOW DISAPPOINTING! Thanks for flagging this up. I have so much to say about this, not least of which is how disappointed I was to actually read over the pattern and discover that there isn’t even a listed gauge! Ugh. I am tempted to take the fair isle charts and create a stranded yoke sweater using EZ’s methods as a guide, but that is a lot of extra work to put into a supposedly complete pattern. The worst part is that if they had simply hired a capable tech editor, they could have produced real patterns with multiple sizes and actual information. Sadly, I think this is a comment on what some big retailers feel is a you-get-what-you-pay for model, which feels more like a slight to hand knitters than anything else. I agree completely, and it is a problem everywhere..not that it makes me feel better or you either…too many people who are designers leave the finishing details like pattern writing to less talented people. My goodness…you have uncovered a big fat worm in the nice warm earth. Good for you! I HATE badly written patterns. They make me nuts! I had never heard of Fred Perry…then I started reading and got all excited because I apparently love Fred Perry….then I read further and now I’m disappointed and don’t like Fred Perry at all anymore :( LOL! Well spotted that woman! Never actually heard of Fred Perry myself but forewarned is forearmed. I love your blog-keep up the good work.